Bonnie and David designed and built this house in 2008, and have lived here since. We love living in Hawaii and the Mountain View area. The climate is cooler and pleasant. I am a carpenter and design and draw house plans. Bonnie works in the social services sector. We enjoy meeting people and are looking forward to having guests in our home. We are miles away from the lava flows and the explosive crater at the summit. We have had no ash or Vog (gas) in the area surrounding the rental. Most of the east side of the Island is safe and unaffected by the volcanic activity. Refrigerator, electric range, dishwasher, microwave oven, rice pot, blender, large sink. Stocked with condiments, spices, salad dressings, rice, pasta, oil, shoyu. Fresh local fruit. Day bed with twin size mattress. Cooler, beach towels and umbrella for day trips. We were delighted with our stay at this beautiful retreat in Mountain View. Bonnie and David were excellent hosts. We really appreciated the fresh fruit they provided for us as a welcome gift. The apt was equipped with everything we could possibly need to be comfortable and enjoy our stay. The apt is conveniently located near Volcanoes National Park. This location definitely exceeded our expectations! Myra and her Husband were great guest. We enjoyed talking with them an sharing our home with them. The apartment had everything you needed and more. It was beautifully decorated and truly made us feel we were in the tropics. The owners were pleasant and helpful. There are still many things to see and do in the area even though the Volcano Park is closed temporarily. If you want to be a bit away from it all, come to rural luxury where you have a clean suite, beautifully furnished and thoughtfully prepared for guests. Bonnie and David have provided everything a guest would need plus more! They live on the lower level ready to assist if you need information or anything else. Comfortable deck overlooking an amazing garden. While Rural Luxury provides a rural and relaxing feeling, it is also readily accessible to the Hilo area which is only 25-30 minutes away. We had booked this location to visit the Hawaii Volcano National Park but due to the Kilauela eruption could not. We found many things to do in the area during our 3 night stay. Please note: you need to walk up a flight of outdoor stairs to get into suite. David and Bonnie are gracious hosts who made us feel very welcomed. The apartment above the main house had all the amenities we needed - very spacious and quaint. 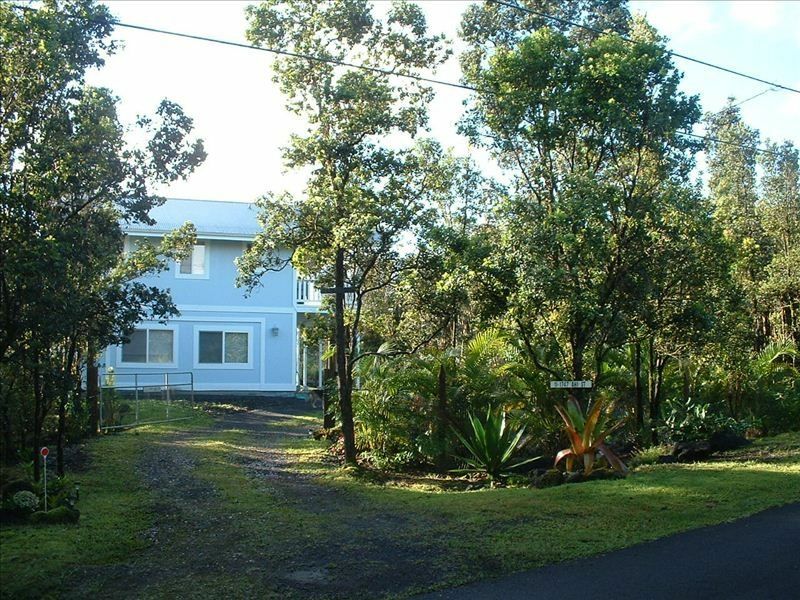 The house was a short drive back into Hilo and we very much enjoyed our 3 night stay in Mountain View. Thanks again! Bonnie and David have designed a beautiful apartment with high-quality finishes and furnished it with everything you need for a comfortable stay! This may be the most beautiful rental you will ever see! The towels, kitchenware, coffee and other cooking basics provided are of high quality. The lanai is spacious and overlooks a beautiful tropical garden. We enjoyed our time in this quiet, secluded setting after spending our days at the spectacular but busy Volcanoes National Park. You can’t beat the price. The nearby Ohelo Café served us an excellent dinner; you may want to call ahead for reservations. Bonnie and David were friendly and helpful. We will recommend this rental to family and friends! Perfect location for quick night trip to view glow of Kilauea Caldera!!! 15 minutes from Volcano National Park. 15 minutes to Keaau Town. 30 minutes to Hilo Town.